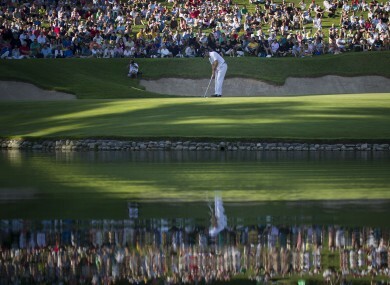 Sergio Garcia on the 17th green last year. NEXT MONTH’S ANDALUCIAN Masters tournament in southern Spain has been cancelled, the European PGA Tour confirmed this morning. The local authorities in Andalucia announced on Monday the competition at the Valderrama Golf Club — won last year by Spain’s Sergio Garcia — would not go ahead, and have now formally confirmed that decision to the European Tour. “The European Tour regrets to announce that the 2012 Andalucia Masters, due to be played at the Club de Golf Valderrama, Sotogrande, on October 18-21, will now be cancelled. “The Junta de Andalucia confirmed this decision by letter which they also announced by a press release on Monday September 10th. The cancellation announcement came amidst concerns over the cost of staging major sports events in Spain because of the country’s ongoing financial crisis. In Valderrama’s case, a change of government in Andalucia appears to be behind the cancellation, with the new authority (led by Prime Minister Mariano Rajoy) keen to reduce public spending. O’Grady absolved Valderrrama of blame, telling Sky Sports: “This isn’t Valderrama’s problem. Valderrama has been tremendously helpful and supportive in the political arena. “This is really (due to) a change of leadership in the area and how they do things. “We always felt this one would be rescued, and we were prepared to go the extra mile with our own money, whether we cut the prize fund or things like that — but you can’t do it if people won’t talk back the other way. Email “Andalucía Masters cancelled due to Spanish economic woes”. Feedback on “Andalucía Masters cancelled due to Spanish economic woes”.